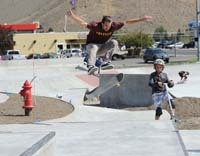 From Hop Porter Park to the skate park, green spaces throughout Hailey are getting spruced up through a renovation program recently launched by the city. Weed control through spraying started in Hailey's parks on Wednesday, June 13, and will continue for about a week. A weekly mowing schedule has been established for all parks. Dog control measures have been increased; dog owners will be expected to follow Hailey's leash laws in the parks and to pick up after their dogs using doggie bags. Trash will be removed frequently from the parks. A Community Park Cleanup day is scheduled for Saturday, June 30, at Hop Porter Park. The community is invited to participate in trash pickup; painting or staining of the pavilion, play structure and picnic tables; repair and tightening of bolts and screws in benches and play equipment; cleaning up the mud pit area; and other general maintenance activities. Webb Landscaping has adopted the Hop Porter Park to perform weekly mowing and maintenance activities. A Community Park Cleanup day was held at the skate park in April, and City Parks Department personnel have been refining the care and beauty of that park since then in preparation for a June 23 grand reopening event. A drinking fountain has been installed, a restroom ordered and pavers put in over the worn grassy areas where skaters tend to access the park. A picnic area and more landscaping features, as well as frequent trash maintenance, have improved the quality of the park. Additionally, a group of volunteers have established a monitoring and mentoring adult group for the skaters. Swenke Landscaping has adopted the park to help with maintenance needs. Keefer Park soccer fields were the focus during May, when Mayor Fritz Haemmerle met with city staff and Sawtooth United Soccer to improve the playing fields and to recondition that area. City crews are thatching and aerating the fields to stimulate the growth of grass, and applying weed control and fertilizer to the fields and park. In early June, Mike Beall of Hailey Co-ed Softball League volunteered time at Lion's Park to repair fencing and bleachers and manage weeds. A gazebo was added to the park by the Wood River Land Trust and a footbridge to the wetlands area is under construction. - Clearwater Landscaping's adoption of McKercher Park. - Whitehead Landscaping's adoption of Balmoral Park. - Lily & Fern's adoption of specialty landscape features at Jimmy's Garden. - Mountain Lifestyles Property Service's adoption of the Park & Ride lot.